DR LIAM FOX’S claim the UK would have 40 free trade agreements ready to sign ‘one second’ after Brexit has been dismissed by his own department. 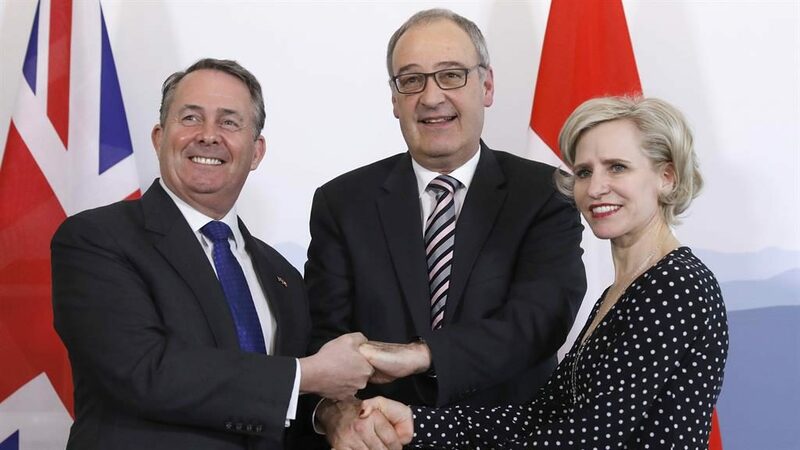 The international trade secretary has only signed four deals so far after a joint agreement with Switzerland and Liechtenstein yesterday, safeguarding £32billion in annual trade. He boasted at a fringe meeting during the 2017 Conservative Party conference it would be easy to sign deals outside the EU and the UK would replicate ones it already had. But a behind-closed-doors event attended by the Department of Trade and Industry (DTI) and senior figures at the likes of Burberry, Mulberry and Hornby heard this was not the case. Dr Fox also appeared to backtrack last night when he told Sky News the ‘vast majority’ of UK trade would be unaffected by Brexit. ‘If I could get to 100 per cent that would be fantastic but it’s about getting the maximum amount we can,’ he added, after meeting Swiss federal councillor Guy Parmelin and Liechtenstein foreign minister Aurelia Frick. So far he has also signed deals with Chile, southern and eastern Africa, and the Faroe Islands. The government has struck mutual recognition agreements with Australia and New Zealand. Carolyn Fairbairn, of the Confederation of British Industry, said the ‘unfolding nightmare’ of Brexit would prevent major trading partners signing deals until the relationship with the EU is resolved. ■ CITIZENS of Norway, Iceland and Liechtenstein already living in the UK can remain after Brexit even in the event of a no-deal, the government has agreed. The reciprocal arrangement aims to remove the uncertainty a ‘hard’ Brexit posed for 15,000 people here and for the 17,000 UK citizens living in the three countries, which are not EU members, but belong to the smaller EEA EFTA group. EFTA spokesman Thorfinnur Omarsson said the agreement secured citizens’ rights ‘regardless of the outcome of negotiations’.